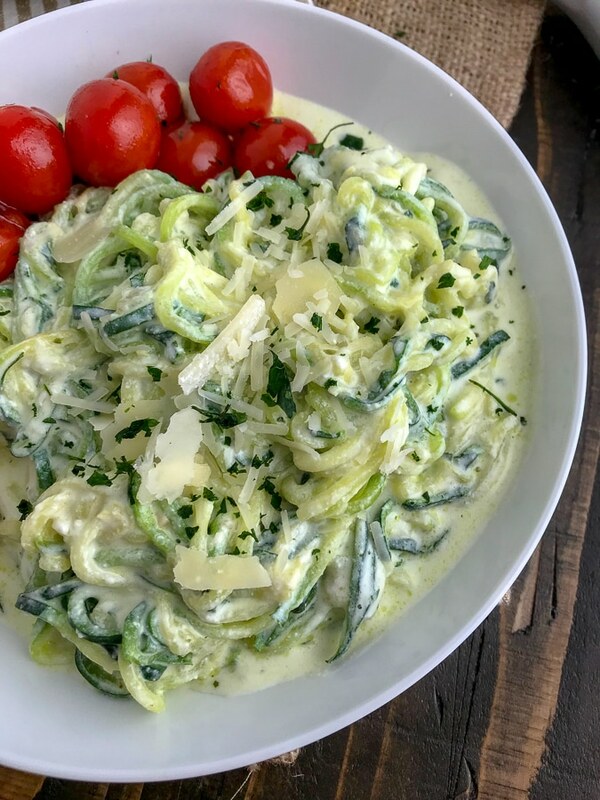 Garlic Parmesan Ricotta Zoodles – Tender zucchini noodles tossed in a creamy garlic parmesan ricotta cheese sauce that is not only delicious, but very easy to make. Guilt-free, low-carb, vegetarian-friendly, gluten-free, and comes together in 20 minutes or less! 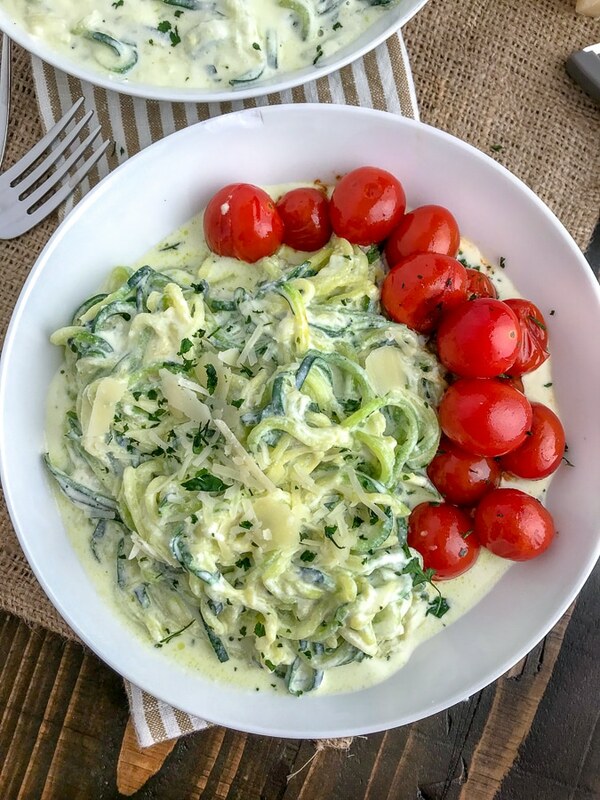 This Garlic Parmesan Ricotta Zoodles recipe is just that – simple and easy. All you need for the main dish are 6 ingredients. Yep, you read right. Only 6 ingredients and approximately 15-20 minutes of your time. What’s not to love about a quick and easy recipe like that? Especially after a hectic Monday back at work or even at the end of what feels like a very long week. When it comes to stress, who else can be a stress eater? Raise of hands? That’s how I can be from time to time. If I’m stressed or under pressure, I find comfort in food. Especially carbs. So when I am stressed and/or craving a bowl of pasta, I do my best to reach for my spiralizer and make zucchini noodles (or ‘zoodles’) instead. They are the perfect alternative to pasta if you’re trying to curb cravings and stay more diet-friendly. Bonus – you’re giving your body an extra dose of vegetables! Win-win if you ask me. 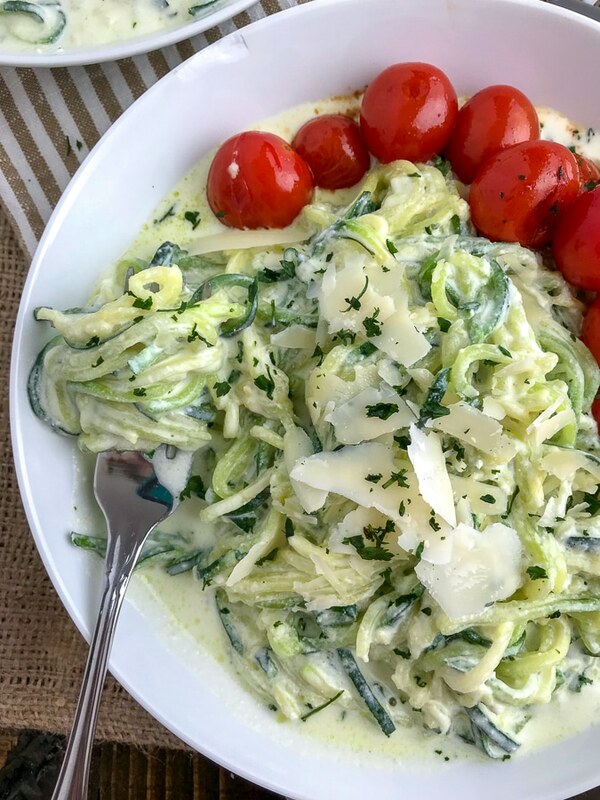 If you’re not familiar with what ‘Zoodles’ are, they are simply zucchini squash that have been pushed through a spiralizer, creating curly noodle-like strands. Which work nicely for twirling around a fork – like traditional pasta! I received a spiralizer as a Christmas gift almost 7 years ago when I first started on my journey to a healthier lifestyle. 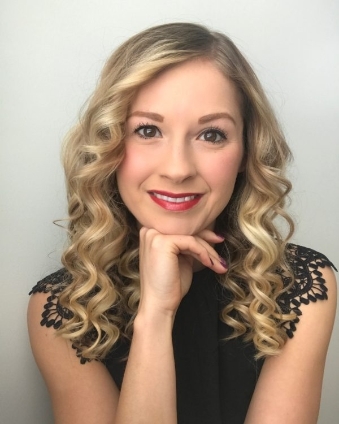 My family knew that my husband and I were cutting back on eating out, working out more, getting into tracking our activity with fitness bands and such. So it came as a neat and pleasant surprise to receive such a gift. I had yet to hear about spiralizing fruits and vegetables at this point. But since then – I have been spiralizing away! One of my favorite zoodle dishes to make is my Grilled Chicken Cauliflower Alfredo with Zucchini Noodles. It’s the perfect replacement for the traditional Grilled Chicken Alfredo Fettuccine that we all know and adore. And it is also one of the most re-made and most popular dishes on my site. 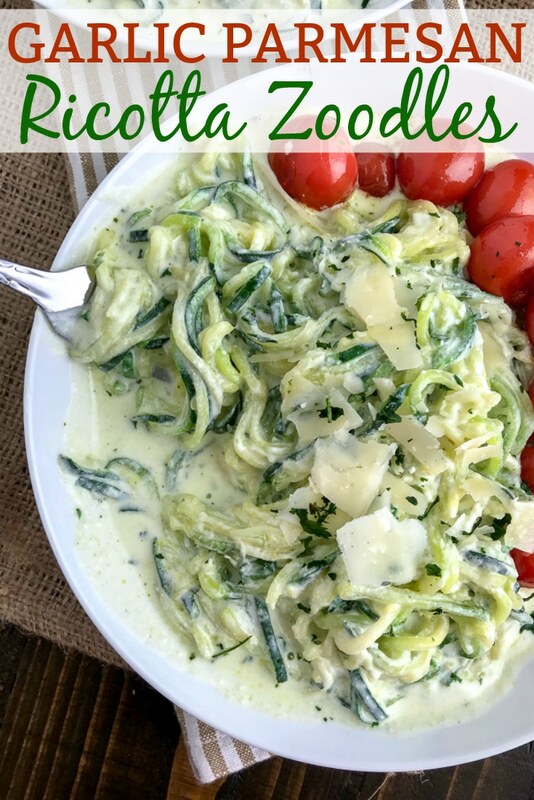 If you’ve made that recipe, then you will love this Garlic Parmesan Ricotta Zoodles dish! 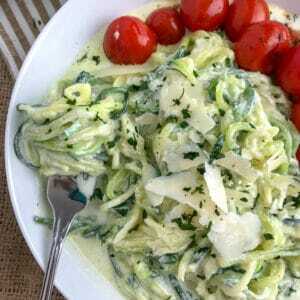 If you don’t have a spiralizer, you can also use a julienne peeler to make zucchini noodles. Just remember to apply a little pressure when peeling from one end to the other, getting as much of the outside and less of the seedy inside. Many people ask me via Instagram and Facebook for tips on how to cook the zoodles. Or if you have to cook them at all. No, you don’t have to cook the zucchini noodles. They are perfectly delicious eaten raw. But if you’re adding this to a warm dish that is a pasta substitute, then I do recommend cooking them slightly. Make sure you don’t overcook the zoodles. Otherwise you will end up with a soggy pile of mush that will be lifeless and not twirl around your fork like it should. I recommend heating them up in a large pan with olive oil over medium heat for 2-3 minutes. Time will be dependent on how many zoodles you add. You want them to be fork tender. I generally prefer to cook my zoodles in a separate pan or prior to the sauce going into the pan so that I can drain any excess water that comes from the zucchini as it cooks. Otherwise it waters down the sauce/dish too much. PARMESAN CHEESE: All cheeses melt into a creamy sauce better when they are freshly grated. I always recommend using a block of cheese for best results, as well as taste. MEATS ADDITIONS: This dish pairs well with steak or chicken! ZOODLES: You can cook the zoodles in the pan prior to the sauce, but this may result in overcooked zoodles (mushy), as well as a runny sauce from any water that cooks out of the zucchini. 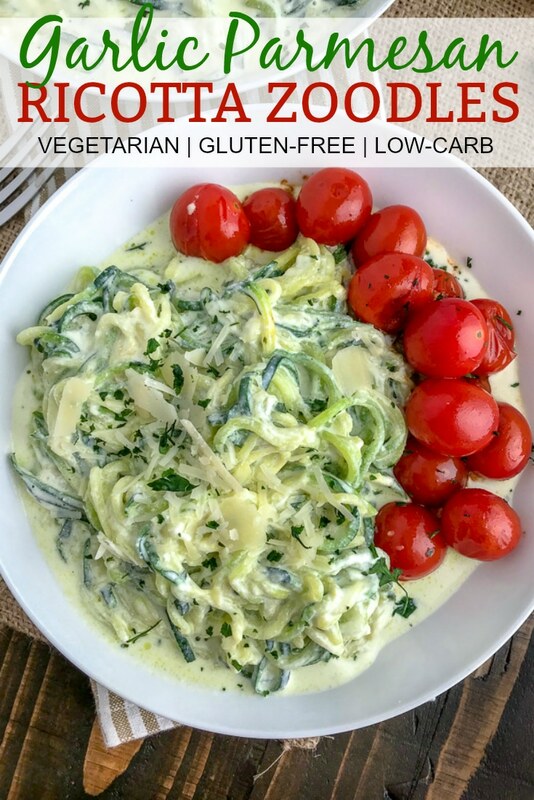 REHEATING: This dish can be rewarmed in the microwave or on the stove, but keep in mind – the more zoodles cook, the more water will be cooked out of them. The sauce will start to thin out. If prepping for later, I recommend cooking the sauce ahead of time and adding the zoodles when ready to re-heat. 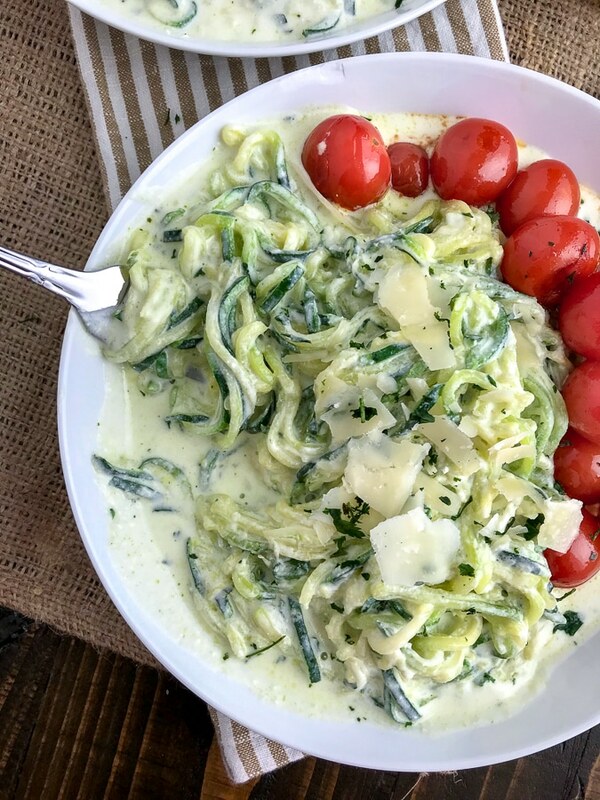 Spiralized zucchini noodles tossed in an incredibly delicious garlic parmesan ricotta cheese sauce in under 20 minutes! Full of flavor, easy to make, and diet-friendly! Place a large nonstick pan over medium heat. Once heated, spray with nonstick cooking spray (or use olive oil/butter) and add the zoodles. Cook 2-3 minutes - or until desired doneness. Keep in mind, you will be adding them back to the pan to rewarm (extra cooking time). Remove to a bowl and cover to keep warm. Drain any water in the pan left from the zoodles. To the same pan add the butter and allow to melt. Once bubbling, add the minced garlic. Cook 30-60 seconds, or until fragrant. OPTIONAL SIDE: Place a medium, nonstick pan over medium heat with olive oil. Once heated, add the cherry tomatoes and cook, stirring or shaking the pan frequently, until the skins start to wrinkle or blister. Season with salt and pepper, if desired. To the pan with minced garlic, add the half and half, followed by the cubes of cream cheese. Alowl the cream cheese to melt, stirring frequently to create a creamy sauce. Add in the ricotta cheese and sprinkle in the grated parmesan cheese and stir until all cheeses are melted and it creates a creamy consistency. Season with parsley, salt and pepper (to taste). Add the zoodles back to the pan and fold into the sauce to rewarm. Serve garnished with parsley, freshly grated parmesan cheese, and blistered tomatoes. REHEATING: This dish can be rewarmed in the microwave or on the stove, but keep in mind - the more zoodles cook, the more water will be cooked out of them. The sauce will start to thin out. If prepping for later, I recommend cooking the sauce ahead of time and adding the zoodles when ready to re-heat.